There are many ways to find yourself locked your car. All it takes is a broken or lost key and suddenly all your driving plans are in jeopardy. If you're at home and you have a spare key, the problem is simple enough but when you're out in the middle of nowhere or even just in the office and without a spare key, what may have otherwise have been an inconvenience could easily become an emergency. But for people leaving in Glasgow or the surrounding areas, it doesn't matter where the problem finds you because you'll always have Auto locksmith Glasgow to attend to you. Auto locksmith Glasgow is a locally based company that operates in all parts of the city and the surrounding areas, providing auto locksmith solutions to customer whenever and wherever they need it. Every day we come across customers who've somehow managed to lock themselves out of their cars. These customers rely on us to ensure that their days get better or their plans aren't thrown into disarray. If you get in touch with us in such a situation, you can always be sure that we will do our best to help. Our company works with many high trained auto locksmiths who know just what to do to get you out of any jam. Whether you just need replacement keys so you can have a few spares for your car or you need to unlock your doors after leaving your car keys in the ignition, our people know just what needs to be done to assist you. Some customers who've need lost keys Glasgow services in the past have complained that some companies don't do a job that is as thorough as it should be. The main challenge when it comes to dealing with Lost Keys is the fact that even stolen keys may simply be considered lost. 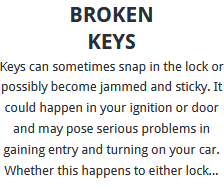 Therefore, if you choose to simply replace the lost keys or use your spare key, you could be leaving your vehicle vulnerable to thieves who may decide to come for your car at night or after a few days when you've let your guard down. At Auto locksmith Glasgow we don't take any chances. 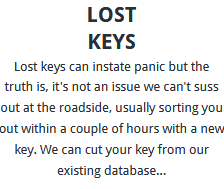 Any lost key is assumed stolen and we always recommend changing the transponder codes in the vehicle to ensure the stolen key won't work in the car. We also provide Broken Keys Glasgow services, a service that is quite popular among those who own cars that have survived for more than a few years and also people who've gone for replacement keys from less than competent auto locksmith companies. Our reliable services provide you with quality Replacement Keys and our Transponder Programming Glasgow service ensures that your new key is fully compatible with your system. Call us today if you'd like a quote or more information. Sometimes the most frustrating problem in a car isn't finding the spares to some highly sophisticated/expensive thing but simply finding the car locksmith Glasgow services you need. 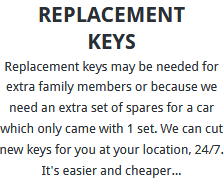 There are two reasons why finding a replacement key has turned into a bit of a headache. For people who own old models of vehicles, finding a replacement key can be difficult because the cars may not be so common on the roads anymore and if the company is no longer up and running, it may even be impossible to find someone who knows what the key looks like. Another problem with certain car keys is the changing landscape of car security. All these new upgrades to the security of vehicles means that it takes more than just the right cut of the key to get past the security system. These kinds of situations can be really frustrating but before you rush off to throw out the entire lock and key, why don't you get in touch with Auto Locksmith Glasgow if you're living in Glasgow city or the surrounding areas. We may have a few surprises for you when you come to us. Our company has been providing car locksmith Glasgow services for many years and our locksmiths are highly experienced career people who've done this kind of work for much of their working lives. This simply means that we have a lot of experience in dealing with many different models of cars and we've even sorted out a few obscure models that most people have never heard of. Because we've been in this industry for so long, we've had time to grow and develop with it. This makes us aware of the changes in the security systems of various vehicle models. This part is usually a challenge for many other companies because this may also require buying new systems that are able to produce keys that are functional with the new car models with enhanced security features. On the other hand, we have no such problem. As a well-established company, we understand the need to invest in improving our skills and equipment and we know we can assist you even if your car is a model that is only just rolling off the production line. 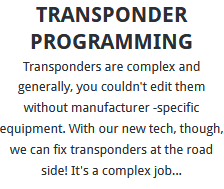 Even car models that come with proprietary security systems are within our capabilities. From locally made cars to German, Italian, Spanish, American and Japanese cars among others, we have worked with almost every available car brand and that is what makes us the best people to call if you have any issue with your lock and key systems. We have a good understanding of how the systems work in various cars and we can deal with a problem much faster than you anticipated or warn you about a small issue that is likely to get worse. Call us today for more information. All Rights Reserved © 2018 Auto Locksmith Glasgow.